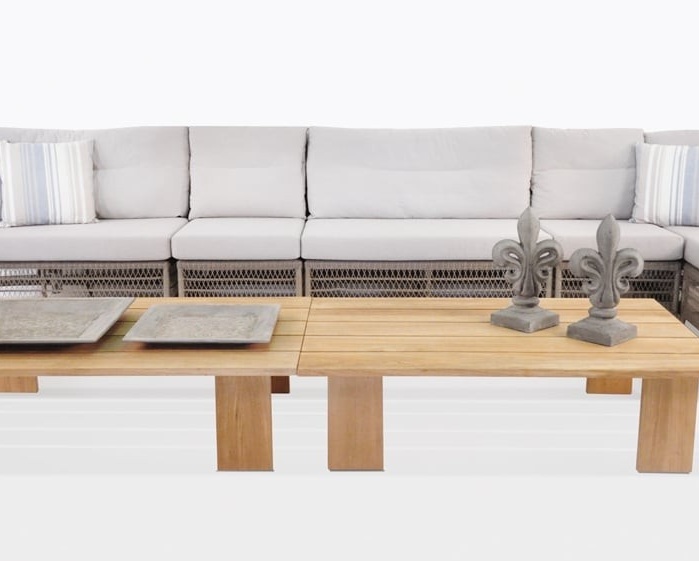 Charming, airy, and high fashion; the Hampton Collection has arrived just in time for the 2014 season of fabulous new outdoor furniture at Teak Warehouse! From the poolside at a European resort to your home, the Hampton Collection in beautiful pastels, will bring the glamour to your patio, porch or garden. 9 amazing pieces and many more configurations; you certainly have options with this versatile set! The Hampton Collection features: a 3 Seater Sofa, the Hampton Pebble Chair, Lamp Table, Hampton Pebble Left or Right 2 Seater, Corner, the Hampton Left / Right Lounger or Chaise and the Hampton Center in Small or Large. What makes the Hampton Collection truly special is the intricate weave of incredible Viro® wicker, looped through in a diamond pattern, reminiscent of old world glamour; which is added to by the unique, puckered warm grey Sunbrella® cushions and supported by a sturdy aluminum frame. Viro® outdoor wicker is an award winning product for its environmentally friendly, non-toxic properties, and UV treated, through-dyed synthetic-polyethylene fabric. All ensuring that won’t discolour, fade, or morph. If you want to create a lavish seating set; try a Hampton Left Lounger with a Large and Small Center, and two Hampton Pebble Rights for a wide ‘L’ configuration! Each seating piece comes complete with Sunbrella® cushions filled with QuickDry® foam!